We are a resource for the friends of Smokey Bear committed to Preventing Wildfires. Smokey needs our help training children and adults how to Prevent Wildfires. Wildfire prevention is everyone’s responsibility! The products on this site can be customized to deliver the message in many innovative forms including: Bookmarks, Business Cards, Greeting Cards, Magnets, Postcards, Posters, Rack Cards, Stickers and Vinyl Banners. Be Sure They're Dead Out! Smokey Says - Care Will Prevent 9 out of 10 Wildfires! There's a lot of ticket writing done for offenders. How about trying a little reverse psychology and start Positive Ticketing! Forest Protection Technician, Gary Horsman of Kamloops Fire Centre, recently approached us about this idea. Gary says "I have seen other fire centres in Canada and across the USA using a small business card with a pin attached. The card has a safety message that campers can refer to when we "catch" them applying all safety measures around the campfire. How about putting Smokey’s Mug... on a Mug? 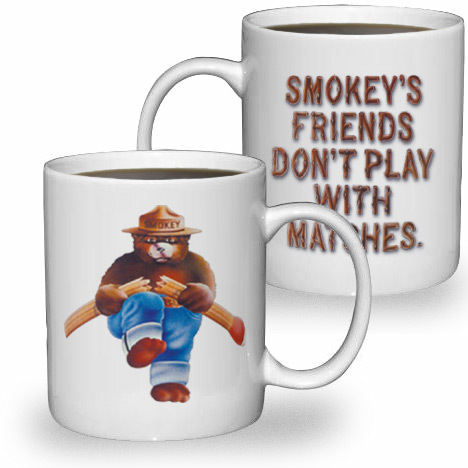 Looking for a method to keep Smokey's Prevent Wildfire messages in the hands of campers, consider putting them on a mug. When you factor in the likelihood that a mug is likely to be retained and repeated used they become a surprisingly economical method for communicating Public Service Announcements. Personalized mugs are ideal promotional items for a number of reasons. For starters, most people really do not worry about owning all matching coffee mugs, and thus they are very likely to keep a cost-free mug inside their kitchen cabinets. A lot of people love to collect items such as personalized mugs and keep them for life. And children love to get their Hot Chocolate in a colorful Smokey Bear mug. 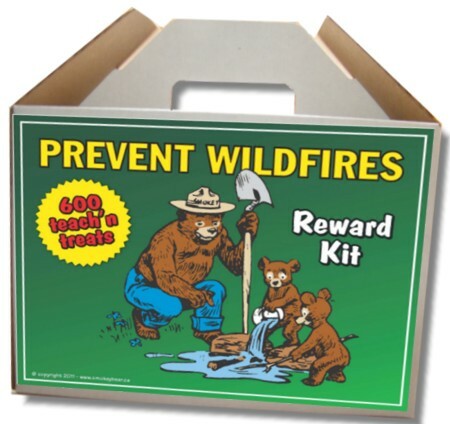 Note: Our Smokey Bear materials are exclusive to Federal, State and Provincial Government Agencies not to collectors, private citizens or other non-governmental organizations.